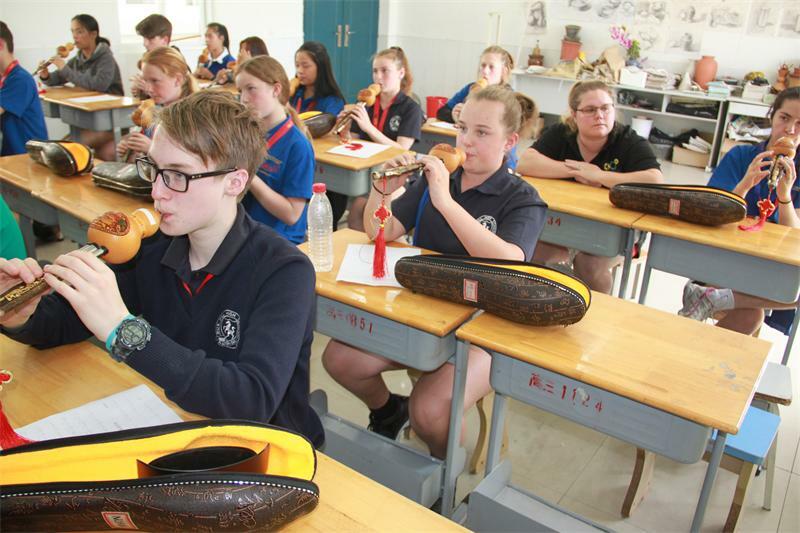 A delegation of 42 students and teachers from Victoria, Australia visited Lishui Senior High School in central Jiangsu from April 8-9, getting a taste of China’s unique culture. The visit is part of the Victorian Young Leaders to China program organized by Jiangsu Education Services for International Exchange, a branch of the Jiangsu Provincial Department of Education, and will run from March 31 to April 21. During their stay in Lishui, the students attended six specially arranged art classes on calligraphy, paper-cutting, folk music, martial arts, and Chinese cuisine. During the calligraphy class, the Australian youngsters learned how to use a calligraphy brush and practiced with their Chinese teacher Zhang Lixin. Some were even able to write their Chinese names and the Chinese characters “澳大利亚” (Australia) after finishing the class! “We hope to instill an authentic Chinese flavor into these cultural classes and give our Australian guests an opportunity to experience the charm of traditional Chinese culture,” a teacher said.